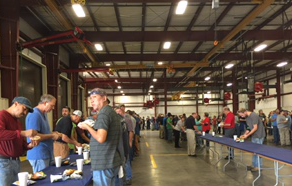 The Mickey team took in lunch and a tour of the company’s new liftgate installation plant. The entire Mickey Truck Bodies Team gathered for a special luncheon recently to celebrate completion of the company’s new liftgate installation facility, the first phase of Mickey’s expansion program at its High Point, NC manufacturing complex. The luncheon was held inside the new building. The 20,000-sq-ft liftgate installation facility is located on the 13-acre site the Mickey purchased in 2015. It houses a total of 15 bays for liftgate installations and chassis preparation. Liftgates are one of the most popular accessories on Mickey’s truck bodies. Mickey is an authorized installer for all major liftgate brands.